I can almost resist everything, except, any books about the Left Bank during the 1940s to the late 1950s. Generally, readers/culture addicts are seduced by images of Paris and its culture throughout the years. In a way, it's the conceptual 'Disneyland' for those who don't live there, yet, keep track of its beauty through pictures, movies, and of course, literature. I'm so much in tune to that world that I pretty much started up a press, TamTam Books, just focusing on the Paris post-war years, due that I love the literature as well as the figures that came out of that time, especially Boris Vian. There are many books on Paris that was published throughout the years, as well as memoirs, diaries, and biographies - so it's not an obscure subject matter by any means. But it wasn't until recently one hears the name Boris Vian in English reading books on the Existentialist period. Vian was a significant figure in those years, and a lot of books about that period avoided his identity, I think due that none of his books were available in English at the time. Therefore I have to presume editors for various presses probably decided if editorial cuts are being made, it is perfectly OK to eliminate Vian in its narrative. That is not the case anymore. 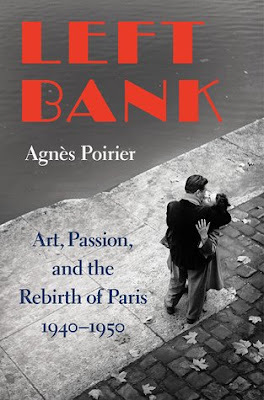 Although he's a side-figure in the recent book "Left Bank" by Agnès Poirier, at least he's given credit as a writer and social figure in Paris. Beyond that, this book doesn't have any new information, and if one is a long-term reader of Paris literary and social history, still it's a fun read and Poirier does a good job in covering all the loose ends of the rambling narrative that is the grand city of romance and ideas. All the stars are here: Juliette Gréco, Sartre, Simone de Beauvoir, Samuel Beckett, Camus, as well as the Americans that came to Paris during the post-war years, such as James Baldwin, Miles Davis, Richard Wright, Saul Bellow, Norman Mailer, and the old stand-by's such as Picasso and Jean Cocteau. A colorful group of characters. One is in good company.